San Diego Unified spokespeople have publicly denied that students were counseled out of district schools. But documents obtained through a California Public Records Act request show that between fall 2012 and fall 2016, school staff members recommended students find a new high school on at least 238 occasions. Genesees Romero knew she was struggling at Patrick Henry High, even before the guidance counselor called her into the office. With nearly 2,400 students, the school was just too big, Romero said. She couldn’t focus. Her GPA stood at .56, documents show. Teachers seemed too busy and distracted to approach for help, she said. She butted heads with staff members – she remembers two in particular – but planned to stick it out at Henry. Her older sister had gone to the same school and despite the challenges, she felt more or less at home. But plans changed the day her counselor called her into the office. Romero thought the counselor had wanted to create a plan to help her succeed at that school. Instead, the counselor recommended she find a new one. “They didn’t even try to help me find a way to focus. They just told me it obviously wasn’t working out for me at Henry and gave me a list of schools to pick from,” she said. The counselor called Romero’s mom and told her a different school would probably be a better fit. Before long, her mom signed a paper, granting the school permission to transfer her to Diego Hills, a charter school in Rolando Park. The change would be written down as a voluntary transfer. The school had not expelled Romero. That’s usually one of the few reasons students must leave a school. Romero didn’t actually have to leave if she didn’t want to. But if the counselor told her that part, Romero can’t recall. “It didn’t feel like it was my choice. It felt like my only options were listed on the paper she gave me,” she said. What Romero describes is sometimes referred to as counseling a student out of school. Instead of reforming a student’s problem behavior, or helping a student succeed academically, school staff can tell him or her it’s in their best interest to transfer. Romero was one of hundreds of students whom leaders of district-run schools advised to leave. The schools were not expelling them but telling them to find a different option. The referral might be an honest recommendation to students who don’t stand a chance at graduating on time unless they transfer to a different school. But the practice can have more troubling implications. A 2007 report from the state Legislative Analyst’s Office warned that counseling students into alternative schools can be a way for schools to rid themselves of problem students and those with low GPAs, making graduation rates appear more successful. A record-setting graduation rate has so far been the crowning achievement of San Diego Unified Superintendent Cindy Marten’s administration, which began in 2013. Between 2012 and 2016, the district’s graduation rate rose from 87 to 91 percent. San Diego Unified officials denied that large numbers of students leaving the district was a factor. Spokespeople denied that students were counseled out at all. “That would be both morally wrong and financially foolish for any school to push out its students,” reads a post on the school district’s website. Just last month, the district’s press office said on Twitter that there’s no evidence to show it’s actually happening. But now, there is evidence to show students were counseled out. 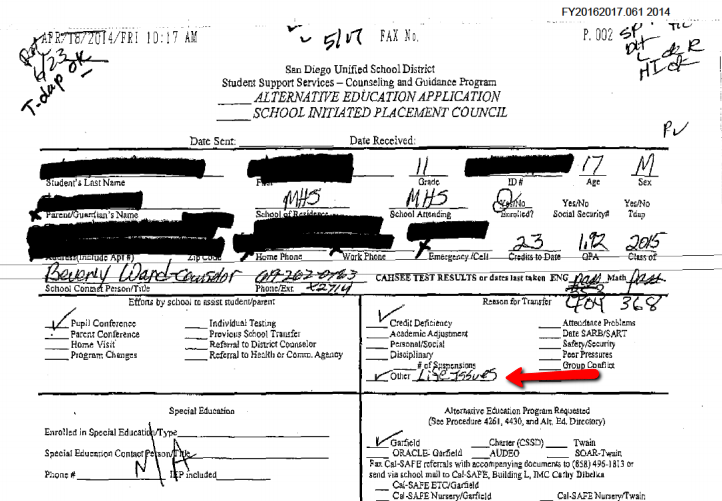 Voice of San Diego obtained documents through a California Public Records Act request that show between fall 2012 and fall 2016, school staff members recommended students find a new high school on at least 238 occasions. That number doesn’t include expelled students, or those who may have received undocumented pressure to transfer. In light of the new information, a San Diego Unified spokesperson clarified the district’s position: High school counselors have indeed recommended credit-deficient students find new schools, but they did not do so to intentionally boost graduation rates. “These school-initiated-placement forms show San Diego Unified counselors acting in the best interests of the students they serve by seeking a more appropriate academic home for those who were struggling academically. That is their role,” wrote district spokesperson Maureen Magee in an email. “You have asked whether the district has a policy of “pushing” students out to charter schools to improve the graduation rate for San Diego Unified. The district’s answer has been – and it continues to be true – that no such strategy exists,” she added. 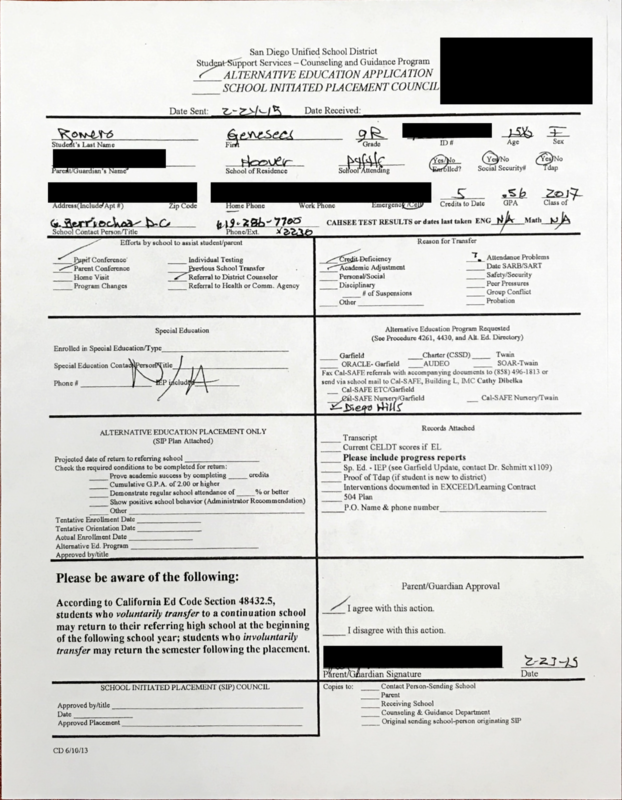 The forms include students’ identifying information, the reason counselors recommend they transfer and the names of the school or program to which students are being referred. Counselors only complete the forms if they’re referring students to an alternative school. Romero’s counselor recommended she transfer due to credit deficiency and that she go to Diego Hills. Romero transferred to Diego Hills, a charter school that offers an independent study program and the ability for students to create their own schedules. A similarly structured school, Charter School of San Diego, drew the most students from San Diego Unified. Both charter schools are considered alternative schools, designed for students who are struggling academically or are at risk of dropping out. Students there can receive one-on-one support, but don’t have to physically attend school every day. They have access to college-prep classes, but most are there to recover enough credits to graduate. Students don’t have to take all the same college-prep classes students need to graduate from San Diego Unified. The fact that different schools in the same city and school district have different graduation requirements creates an incentive for schools to simply push lower-performing students into the programs from which it’s easier to graduate, said Robin Lake, director of the Center for Reinventing Public Education, which researches education policy. “There’s nothing wrong with schools taking different approaches to meeting kids’ needs, but there’s everything wrong with different schools having different standards of excellence and failing to help kids meet those standards,” she said. Romero isn’t happy Patrick Henry leaders asked her to leave. But it seems to have worked out for her. Romero said she found a welcoming vibe at Diego Hills as soon as she walked through the door. She started thriving with one-on-one support, her teacher at Diego Hills told me when I first met her last year. He said Romero seemed stubborn when she first arrived, but that also might be the reason she’s persisted in school despite the obstacles. Now 18, she’s on track to graduate next year. Then, on to college. She wants to be a registered nurse. San Diego Unified leaders see losing students to charters as a financial challenge. Because state funding is tied to each student, when they walk out the door, the money leaves with them. San Diego Unified has its own alternative schools that accept students who are struggling. But they also have to meet certain criteria to enroll. Records show in-district alternative schools don’t accept all students they are sent – sometimes because it’s too late in the school year, or the student’s needs are too severe. At least 115 times since 2012, students did not enroll in the in-district alternative schools to which they were referred. Many of those students ultimately opted to attend a different school, like Charter School of San Diego or Diego Hills. To counter the trend, and hang onto more of its students, the district is opening what it calls innovation centers, which will be attached to four high schools. Now, instead of recommending that low-performing students transfer to alternative schools, those students will be offered the same services at their home high school. A district document shows that students taking classes at the innovation centers will be able to recover credits they missed – usually through online classes – and will be able to pursue what’s called an “option two diploma,” typically offered at alternative schools. To earn a regular diploma from San Diego Unified, students need to complete 44 credits, including a series of college prep courses they would need to get into University of California and California State schools. An option two diploma, on the other hand, only requires that students complete 26 credits and does not require all the same college prep-courses. An option two diploma meets San Diego Unified requirements same as the regular diploma, but does not allow students to enter a four-year university. It’s an open question as to whether struggling students will choose to stay at their schools even with the expanded menu of options innovation centers will offer. Last year, a handful of students at Diego Hills said they wouldn’t return to their schools even if offered a more flexible program. To them, changing schools had more to do with escaping a hostile environment and the desire to start fresh. San Diego Unified’s class of 2016 was the first that had to graduate under more rigorous standards. For the first time that year, students had to complete a series of college prep classes known as A-G courses. The idea behind the change was straightforward: For too long, a student’s chance of entering a four-year school depended, in part, on the high school they attended. Access to college-going classes was unequal across the district. So in 2011, the school board voted to make those A-G courses a requirement for all students. Critics worried graduation rates would fall once the school board raised the bar to graduate, but district officials dismissed those concerns as knee-jerk and racist. From the district’s perspective, the effort paid off. Last year, when the district announced the class of 2016 was on track to set a record high graduation rate of 92 percent, Marten declared victory. “San Diego is changing the education conversation in the state of California by showing you can raise graduation standards and graduate more students at the same time. The fact that it is our children leading this change — by stepping up to meet the challenge — makes me incredibly hopeful for the future,” she said at the time. Implicit in Marten’s statement is that the district raised the bar and simultaneously helped students reach it. But that leaves aside the fact that 35 percent of the class of 2016 left a San Diego Unified high school before they graduated – a higher rate of departure than any other urban school district in the state, including Los Angeles, San Francisco, Long Beach and Fresno Unified. Students who left for charter schools had a combined GPA of 1.75 at the time they left – not high enough to graduate from San Diego Unified, which requires a 2.0. And it misses the point that while the graduation rate was climbing, school staff members were urging credit-deficient students to transfer to alternative and charter schools. Like his colleague Richard Barrera, San Diego Unified school board trustee John Lee Evans acknowledges that high schools have, in the past, recommended credit-deficient students leave for charter schools. But he stopped short of saying it was a problem. But even if an educator’s recommendation comes from an honest place, the very fact they have the option of sending low-performers or problem students into schools where it’s easier to graduate creates a perverse incentive for them to do so, said Lake. “We’ve seen this occur in every kind of school – district, charter, private – absolutely it can happen. Parents learn very quickly that they have to advocate for their child wherever they are,” Lake said. Because they have more serious needs, Lake said students with disabilities are particularly at risk for being pushed out of a school. “There are a set of signals that parents with kids of special needs become very attuned to. Statements like ‘this might not be a good fit,’ or ‘we think you kids would be better suited for another school’ sends a very soft but very clear message that: your kid is not welcome here,” Lake said. But the broader problem Lake sees in San Diego is that various schools in the same city, and even the same school district, vary in their graduation requirements. The fact that students in San Diego Unified would have to meet different graduation requirements depending on whether they attended a traditional district school, an alternative school or a charter school creates more cracks in the system students can fall through. And while aligning charter school graduation requirements with those of school districts might prove mechanically difficult, the district could increase its transparency by publishing the number of students who graduated from San Diego Unified schools alongside those who left for charter schools. UC San Diego researchers analyzed San Diego Unified’s class of 2016 graduation rate. They made that very recommendation in a report published in September. District officials have said they’re looking into it, but have not committed to taking it up. Correction: An earlier version of this post misidentified a report from the state Legislative Analyst’s Office. The report was published in 2007 and can be found here.